Despite a tense, neck and neck first quarter, Trent’s local rivals, the University of Nottingham, dominated the remainder of the match and reclaimed their trophy 66-52. 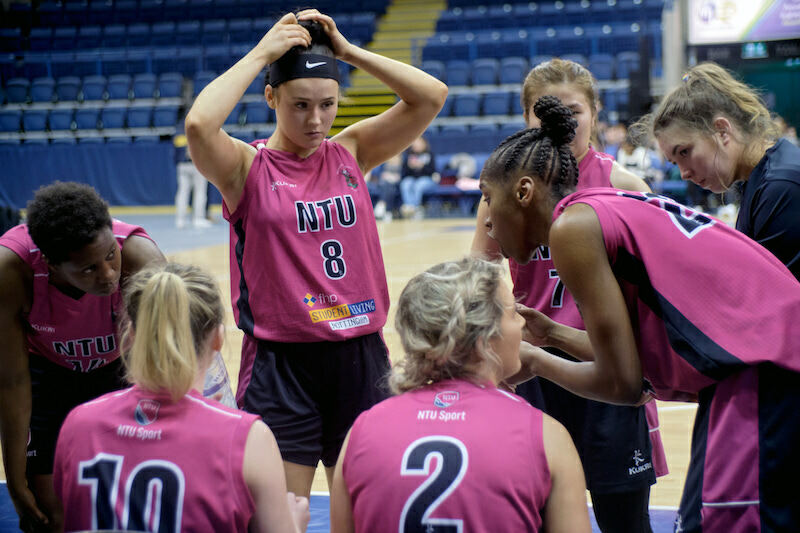 Trent took the lead in the first moments of the game at the Motorpoint Arena, with a confident three pointer from Captain, Vicky Gray and a solid free throw point from scholar, JoLanna Ford. NTU’s attacking strength put them ahead at 16-7 during the first quarter and it seemed UoN were finding it difficult to break through Trent’s formidable defence. JoLanna Ford’s powerful display put her as a close contender for MVP throughout the match and she was top scorer in the first quarter before being substituted. A short spell of sloppy play by Trent allowed UoN to charge through their defence and reclaim nine points, and end the final quarter on a draw 16-16. UoN took the lead in the second quarter and remained ahead at the end 33-27 due to precise free throws and a stylish three pointer. UoN’s number 6 dominated the court and scored her third three pointer of the game in the penultimate quarter, this allowed the girls in green to claim a ten point lead over Trent. Trent’s captain Vicky Gray oozed confidence when taking free throws and tracked back in defence to deny UoN a further lead. They went into the final quarter 53-40. NTU looked shaken by UoN’s continued attacking pressure in the key. The girls in green sunk two stylish three pointers past Trent’s defence and commanded play in the final quarter. UoN confidently claimed the final quarter and took home the title 66-52. Trent proved resilient up to the final whistle and pressed their rivals till the end. NTU captain Vicky Gray was awarded player of the match for her tenacious, outstanding performance.